The OS Landranger Map is ideal for planning the perfect day out. This best known national map series provides all the information you need to really get to to know an area, whether you are a visitor or a local resident. Yellow Walk Maps. 1:16 000. 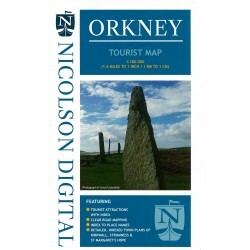 Ordnance Survey Explorer Series map covering the Orkney East Mainland 1:25 000. Ordnance Survey Explorer Series map covering the Orkney West Mainland 1:25 000.